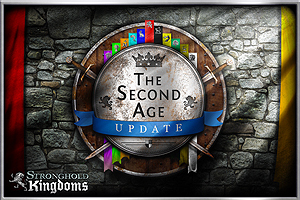 The Second Age (Age II) is an advanced gameplay world within Stronghold Kingdoms™. Beginning after the Glory Race for a game world reaches its end, this evolution of the world features a faster style of play, new opportunities and fresh challenges. The Second Age is designed to shake up the established order and generate fresh political conflict. Glory The Glory Race will be reset and all Houses will be re-introduced to the Glory Race with 0 points. Factions & Houses All players will be removed from their factions and all factions removed from their Houses, as well as any alliances. Stock Exchanges All stock exchanges will be cleared of their resources and prices reset. Capital Buildings All capitals buildings will be deleted and their levels reset. Bonuses from deleted buildings will not remain. Forum All capital forums will be cleared of all threads and messages. Flags All capitals will lose their current flags and reset to the default starting number. Leadership Leaders of all capitals will be cleared and their current votes reset. Gold All capitals will lose their gold. Increased number of Factions per House The maximum number of Factions per House is increased from 12 to 20. Increased Troops & Units speed The speed of all armies and scouts are doubled. Increased costs when using Monks Interdictions and Excommunications now cost double the amount of Faith Points. Glory tripled The amount of Glory rewarded to a House for holding Leadership positions is tripled. County Capital influencing Monks can now be used to influence votes at County Capitals. Vote caps The number of votes for leaders of Counties, Provinces and Countries is now capped at a maximum. Capital Building Bonuses In the Second Age, once a building is deleted from a capital, the capital does NOT retain the bonus from the upgraded building. Hall Of Heroes All members of the winning House at the end of the Glory race will have their names recorded in the Hall of Heroes, which can be viewed at strongholdkingdoms.com. For more information visit The Second Age on the Stronghold Kingdoms Wiki. You say World 2 starts today, but in the body of your post it looks like you are saying that it is Age 2, not World 2 that starts today. Am I correct to assume that it is just Age 2 that is starting and not the second USA world? Wish there was a vote the usa1 world could do to skip the 2nd and 3rd age, waste of time honestly. I'm sure most of the world would agree with me.